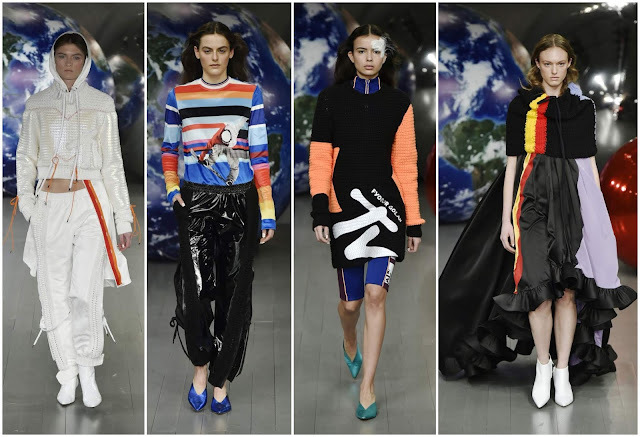 A porcelain jacket with a drawstring detail and orange and red trim, a crochet sweater with an MTV-logo accent, and elasticated tracksuit bottoms with crochet panels was the first look out at Fyodor Golan’s London Fashion Week show in February. Practical, 90s-inspired, sportswear-inspired—it captured the mood right off the bat. My first observation was that the clothes weren’t designed for Instagram but for the Instagram generation, and some were made for the runway but not for real-life. Designed by Fyodor Podgorny and Golan Frydman, the collection was “an active journey upwards; a sky tribe of power and energy,”, and it mused on aerodynamics. They were inspired by hot-air balloons and parachutes. There were some believable reflections of this (the woven-rope accents on dresses giving it a casual, sporty aura) and some not so convincing (billowing ballgowns that were a little too ‘deflated balloon trailing lifelessly behind’). With most looks they navigated a middle ground, imbuing the clothes with an urban functionality. Proof that they were speaking to the digital generation was with the vintage sportswear elements. You can’t scroll through the application without being confronted by an advertisement for vintage sportswear. The platform itself has become a seemingly endless sea of windbreakers, jackets and sweatshirts -- “activeness and indulgence.” Tracksuits were enlivened with faux-fur; puffer jackets came in printed vinyl; faux-suede was mixed with crochet. Their desire to reach the millennial audience was further reflected in their partnership with MTV. (They aren’t the first to licence the logo. Marc Jacobs did it for Resort 2017. Martine Rose did it for Spring 2018.) In terms of 90s iconography, MTV’s logo and its graphic nature, is more palatable than Matrix-inspired sunglasses or baggy denim. The appearance of it here is indicative of the nostalgia surrounding pop culture from the 1980s and 1990s, as dictated by a plethora of Instagram accounts. Fyodor Golan’s influences distinguish them from their contemporaries. It isn’t as po-faced, self-serious or austere as many of the other brands. Although that works for them in crafting a certain type of image, the duo at Fyodor Golan are more concerned with youth culture’s intersection with popular culture. Their references have attracted collaborations with My Little Pony, Coca-Cola, Power Puff Girls and Chupa Chups. They are well-versed in the subtleties of persuading a customer to believe in alliances between a fashion brand and pop cultural institutions by constantly referring back to the idea of youth culture. Ultimately, these partnerships have be spun with a youthful verve to be convincing. The duo were the recipients of the BFC’s Fashion Trust grant in 2016 and 2017. Their work is bought by 35 global retailers and recently Bella Hadid was spotted wearing a dress from their Spring 2018 collection. As much as the retailers who stock the brand, the patronage of Bella Hadid is currency in the current climate. At the mouth of their runway this season, there was a large-scale model of the globe—amongst metallic orbs—that was suggestive not only their imagination of “flight and jump” but of their personal growth as a 7-year-old brand. In January, they announced they sold a “significant minority stake” of their company to Eiesha Bharti Pastricha. (Pastricha’s previously invested in Jonathan Saunders and Roksanda.) This will allow them to relaunch their e-commerce operation, expand their direct-to-consumer and switch to the see-now, buy-now format without skipping a season.